Parents win in battle to provide more selective school places. 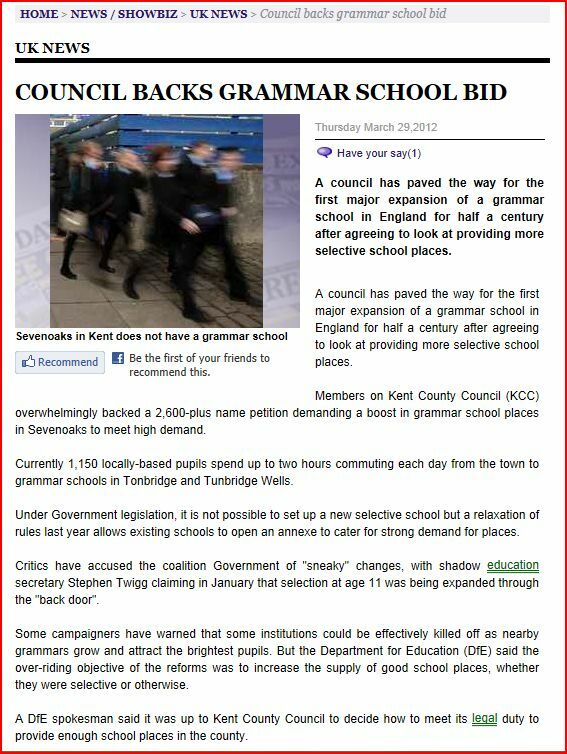 Kent County Council overwhelmingly backed a 2,600-plus name petition demanding a boost in grammar school places in Sevenoaks to meet high demand. Perhaps John O’Dowd and other “educational experts” in Northern Ireland need reminding of the Martin McGuinness instigated Department of Education Household Survey of 2002 in which the majority of respondents told the Sinn Fein DENI Minister that they wished to retain the 11-plus and academic selection. The difference in the two campaigns is the fact that 200,551 respondents took part in the Household Survey and yet John O’Dowd persists in his bullying campaign to try to eradicate grammar schools. Northern Ireland still has a very popular 11-plus testing system – the good news is that it is out of Minister O’Dowd’s reach. Northern Ireland Education Minister issues gaffe press release: Remedial English lesson required. John O’ Dowd, Education Minister for Northern Ireland issued a Press Release via the N I Direct Executive web site announcing his decision for the future of assessment at GCSE level. Unfortunately for the hapless Sinn Fein representative the extent to which the Minister is not fit for purpose is revealed in the content of his PR. Announcing an increased emphasis on punctuation, grammar and spelling, Mr O’ Dowd includes a spelling mistake for good measure. The mistake was contained in a paragraph referencing O’Dowd’s equivalent post-holder and political nemesis in England, the Secretary of state for Education. One may only assume that someone prepared the press release, someone proofed it and the minister actually read it prior to publication. On the other hand….. 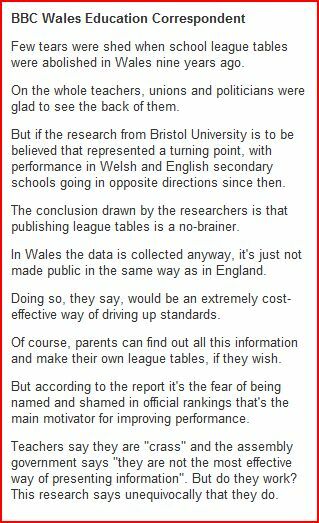 Warning for Parents: School League Tables & their Limitations – the DENI ignore evidence. 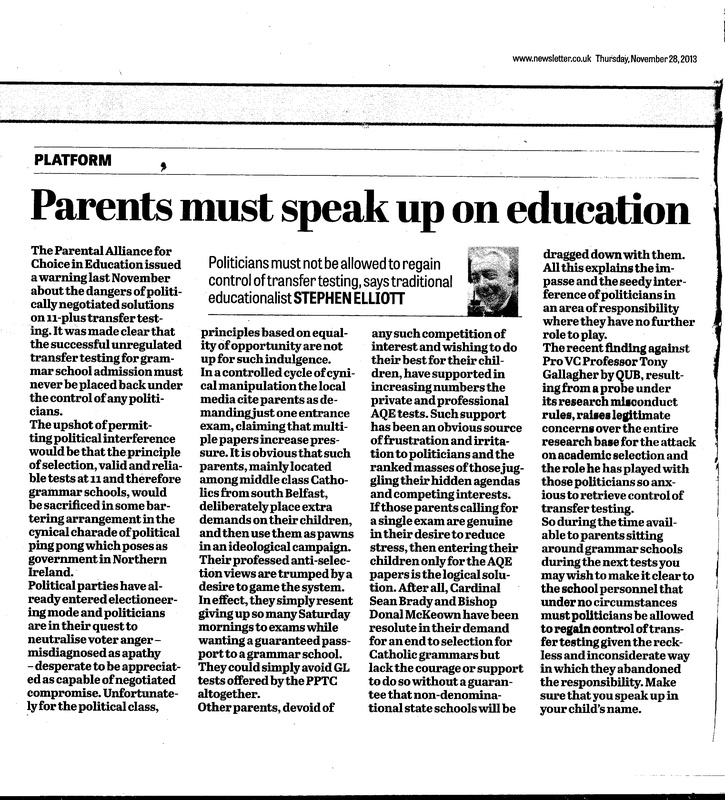 Absent a willingness or ability of the Detail.tv and the Belfast Telegraph to address the DENI data on pupil performance at GCSE and A-Level, Paceni offers a warning to the DENI and some reassurance to parents. Martin McGuinness banned such tables when he was Education Minister in the 1990s but his party colleague John O’Dowd has reintroduced them via the media to persist in the attack on academic selection and grammar schools. 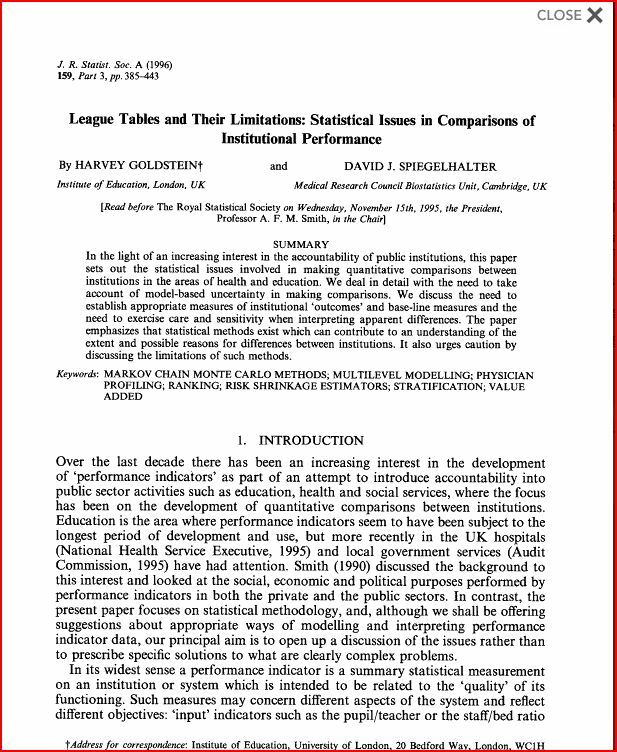 However no reference has been made by any education correspondent to an important paper published in the Journal of the Royal Statistical Society in 1996. John O’Dowd and the DENI have a statistics and research branch http://www.deni.gov.uk/index/32-statisticsandresearch_pg.htm but it would seem that they ignore warnings provided by those who cautioned against the inappropriate use of data to compare schools. The reason is quite clear. 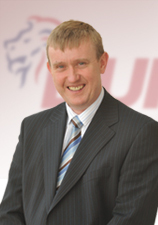 Mr O’Dowd is stepping up his attack on grammar schools for political and ideological purposes. Unfortunately other political representatives are colluding with O’Dowd in order to panic and decieve parents. If the DENI have a response to Harvey Goldstein and david Spiegelhalter the world would be delighted to examine it. If there was ever a need to answer the persistently wrong and ideologically failed attack on academic selection by 11-plus testing carried out by the DENI, an answer to an Assembly Question by a Sinn Fein MLA gives a resounding response. To ask the Minister of Education how many complaints each Education and Library Board has received in relation to preparing primary school children for transfer tests in each of the last three years. It is little wonder that there were no press releases, planted media articles or angst-filled human interest stories obediently spewed up using words and phrases such as child abuse, stress-laden, difficult, morally wrong, scandalous. The DENI have known since the Household Survey of 2002 that the majority of parents want valid and reliable transfer testing at 11. Their miserable decade long campaign has resulted in failure but the DENI promote failure by denying the taxpayers their right to regulated testing and then object to and hamper those who suceed in doing their work for them. If an example of promoting failure is required then linking the ending of regulated transfer tests to the promotion of the multi-jobbing ESA Chief Execuive may be a good place to start. Also note that there has been no effort by the unionist parties to highlight the response to AQW 6202/ 11-15. This may be explained by their secret desire to see the issue of transfer testing disappear or perhaps they don’t read answers that don’t refer to themselves. One written complaint was received by the Western Education and Library Board in the last three years in relation to a primary school in that area preparing its pupils for unregulated transfer tests. No written complaints were received by any of the other boards during that period and records are not kept of any verbal complaints. In 1999 during the euphoria following the Belfast/Good Friday Agreement in Northern Ireland the then Education Minister, now deputy First Minister, Martin McGuinness banned the publication of school performance or league tables. The TES http://www.tes.co.uk/article.aspx?storycode=348747 published an article calling for a similar action in Wales. Fast forward a decade. 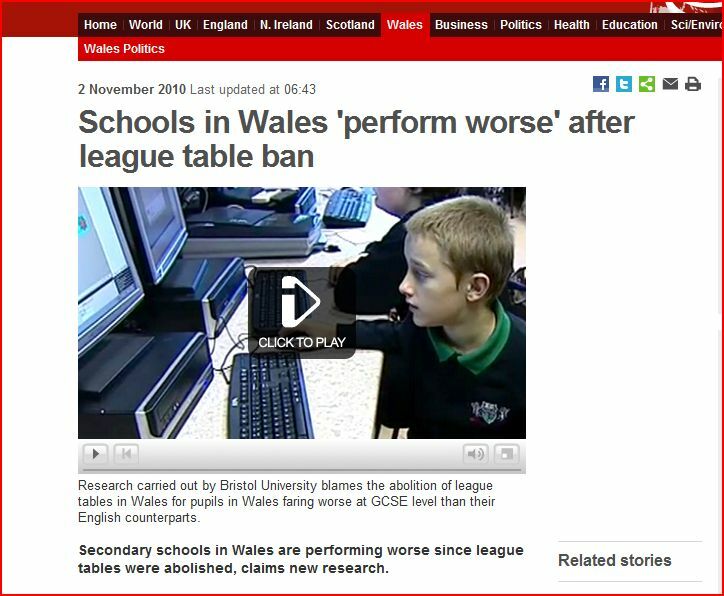 Research published this week http://www.bbc.co.uk/news/uk-wales-11669714 on the effect of such an action in Wales, another UK devolved jurisdiction, showed the effects of simplistic ideological imposition versus application of sound scientific evidence. McGuinness and his party were wrong in 1999 they remain in error and denial today. Children from disadvantaged areas throughout Northern Ireland have suffered enough at the hands of so-called “reformed” terrorists. To deprive them and their parents of information on the effectiveness of their teachers is despicable. McGuinness’ replacement in the Department of Education, Caitriona Ruane has adopted the same Marxist ideology of imposing equality of outcome in her failed attempt to end academic selection. She has also failed miserably to improve numeracy and literacy results for the disadvantaged while ignoring and delaying the publication of evidence that public opinion did not support her policy. Ruane was a prominent member of the Bring Them Home campaign for the Colombia Three, which sought the safe return of three Irishmen later convicted in their absence in Colombia of training Marxist rebels. Parents should insist that politicians re-introduce performance/league tables in Northern Ireland as a priority. The naming and shaming exercise has already been highlighted in this blog when the Los Angeles Times published information on teachers performance despite threats from the teaching unions and a threat of boycott. Ruane might want to head up another crusade – The “Bring Them Back” campaign – for school performance tables. Don’t hold your breath. Peter Robinson this morning signaled his personal willingness to sacrifice the principle of academic selection in order to stay in power. In a statement conveniently timed with Cardinal Brady’s announcement for the future comprehensivisation of Catholic education, the DUP leader has signalled to Sinn Fein and other anti-selection that it is now safe for them to make academic selection and the 11-plus an issue over which they can threaten to bring down the Northern Ireland Executive. Peter Robinson has made the principle of selection negotiable. Unfortunately Mr Robinson has not insisted that during the interim period before any introduction of Computer Adaptive Testing, the AQE CEA 11-plus must become the only acceptable exams option not the GL Assessment one day and inferior approach. Leaving the decision on agreeing a single test to grammar school principals at a meeting in Methodist College this evening is akin to Peter Robinson and the DUP insisting the the Ulster Unionists endorse the Hillsborough Agreement with Sinn Fein. Peter Robinson must think all unionists are educationally disadvantaged. Otherwise he would have thought through his proposal to allow decisions of the Executive, such as on education, to be taken by any three parties. S(election) at 14 has been once again floated by the educationalists including the DENI’s favourite, Professor Tony Gallagher and all the main churches. Since the Catholic Church have found themselves, once again, unable to tell the truth, the whole truth, and nothing but the truth on the sexual abuse of young people by their clerics it must have crossed the minds of those, aware enough to appreciate that they have a virtual monopoly on the education of Catholic children, that there may be a link. If this is Peter Robinson and the DUP’s idea of getting out of jail free on the academic selection at 11 problem they have little concept of the pending backlash. Be careful what you wish for is the best advice PACE can give their educationally and strategy disadvantaged politicians. It will hardly escape the notice of most that while Professor Gallagher and the Belfast Telegraph are calling for Caitriona Ruane to “Sit Down and Sort it Out” it is Professor Gallagher’s advice and research to the DENI that created the mess in the first place. Compare and contrast the statements from Prof T. Gallagher made this week to the research he was paid for delivering to the DENI in 1998. “A decade of debate has produced no consensus, only a self-interested battle of wills between the Minister and the grammar lobby in which the only losers are our children. The chaos must not be allowed to continue. St Andrews means responsibility for re-establishing a regulated system rests with the DUP and Sinn Fein. Can we end the injustice of early, high stakes selection and preserve the academic traditions of the grammar schools? Some form of selection at age 14 fits with the revised Northern Ireland Curriculum and with collaboration in area learning communities. It can advance the goal of making every school a good school, and give every child genuine curriculum choice and a guarantee of a high quality education. Instead of parroting the flawed and contradictory views of Professor Gallagher the entire political body of MLAs and those omnipresent “education experts” should hold him to account for his flawed analysis. Professor Gallagher seems more concerned with propping up the Assembly mandatory coalition than admitting his role in helping to undermine and destroy and education system that worked for the vast majority. What the DUP can do for Caitriona Ruane, Minister of Education. Is Mr Storey suggesting that we may soon not have an Assembly? Is he pre-announcing further concessions on education? Is he exhibiting the DUP’s practiced pattern of making many promises to the electorate but failing to deliver? So how did we end up where we are today? Why did it happen that Education did become one of then main areas of struggle? Well the answer is simple …. Caitriona Ruane…..
Or Minister RUIN Rather than Ruane !!! I once said she was grossly incompetent – that means 144 times worse than the routinely incompetent. When it comes to education matters Caitriona Ruane is about as confused as Adam was on Mothers day and is about as much use as a trap door on a canoe! Although to be fair she didn’t nominate herself. No! She was Gerry Adams first pick. …. 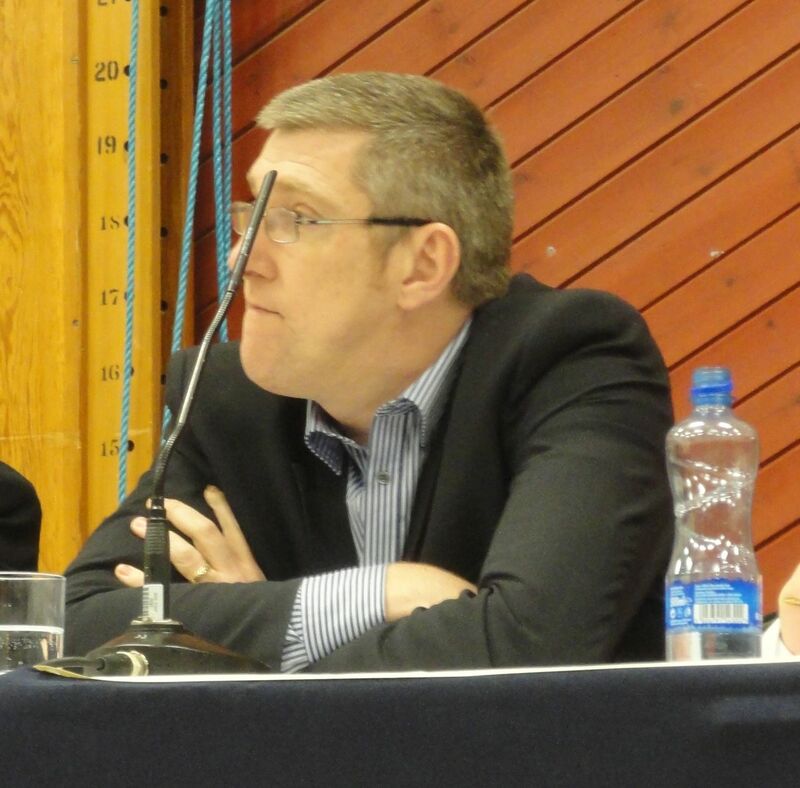 Out of all of the Sinn Fein talent on display … better than Paul Butler … better than Sue Ramsey…. better than Jennifer McCann… better than her namesake Fra McCann… better even than Barry McElduff! Caitriona Ruane was Gerry’s golden girl. This, remember is the Minister who couldn’t get involved with the classroom assistants dispute and who couldn’t get involved in the Movilla school dispute. Who told us when she was dragged to the Assembly to answer a priority question, about the school dispute she said, we are where we are !!! This is the Minister who cannot find time to answer Assembly questions in the stipulated time. But she will spend months banging her head off the brick wall of the legal guarantees this party negotiated at St Andrews. In doing so she allowed a situation to develop where other important matters have been overshadowed by her futile approach to the transfer debate. The Minister’s failures meant that the rest of us have had to do the job she ought to have been doing, but couldn’t find the time. Conference we will be launching a new document highlighting many of the areas in education that we are determined to improve. The DUP is in favour of excellence. Excellence for all schools delivered to all pupils. On the matter of transfer we have met with a wide range of stakeholders and will be doing so again in the coming days. I will be meeting the Catholic bishops, which will be more an experience for them than me. Doesn’t it say something about this education Minister that the Catholic Headmasters are closer to our position than they are to hers. Parents are distraught at her failure and behaviour. Teachers are frustrated. Children are stressed. It appears that for the Minister the future education of the Province’s children is less a priority than Policing and Justice Powers. It appears that she prefers to bury her head in the sand and take no responsibility for the chaos and mess she has presided over. It appears that she prefers confrontation to agreement. It appears that this Minister would prefer an unregulated transfer system to one agreed between her and the other political parties. Conference – that is not my way or the DUP’s way. We have acted differently from this missing Minister – this Minister for mayhem. We didn’t just simply pocket the guarantees won at St Andrews. We have got involved and got our hands dirty. Where the Minister sat on her backside and failed to behave as a minister and to do her job, I along with my colleagues got up, got down to work. We have shown that it is not the few but all the children for whom we want the best possible education provision. We will continue with that goal in mind. It ought to be a cause of shame, though I doubt their ability to feel it, for Caitriona Ruane and her Party, and it is a source of gratitude for us that as a consequence of that, people today look to this party for action and answers rather than the person whose job it actually is. Until Monday 15th June that is!